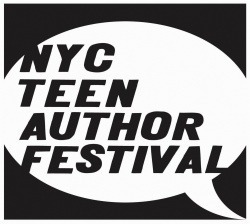 I’ve been invited back to the NYC Teen Author Festival this year! Somewhat surprising, given the madness that ensued during our “Inside the Mind of a Teenage Boy” panel last year at the Tribecca B&N (favorite moment, Barry Lyga saying “You can’t handle the mind of a teenage boy!”). But hey, it’s a teen author festival. Gotta keep it edgy, I guess. Wow. Righteous Babe or what?